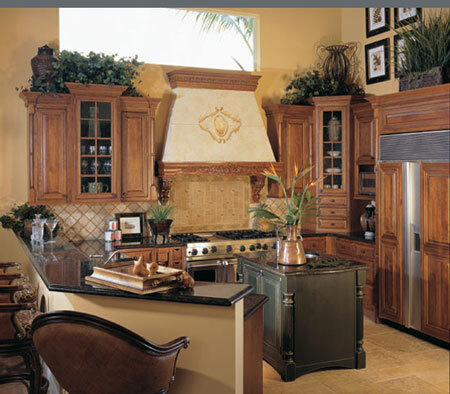 An antiqued Forest Green island anchors the cherry cabinetry in this beautiful kitchen. With nearly endless combinations of opaques, stains, glazes and distressing options available on six wood species, Omega custom cabinetry helps you create exactly what you want. Why settle for a kitchen like everyone else's? Omega's exceptionally wide range of choices, solid construction and high quality finishes let you create exactly the kitchen that feels the most like home to you. Click here for more information about Omega Cabinetry.